Long and short hair wool at the South Central Family Farm Research Center in Boonesville, Arizona. Wool refers to either the fine, protein fiber with overlapping scales that forms the coat of sheep and some other mammals, or to the material made from his hair. The term particularly refers to the fiber of animals of the Caprinae family, principally sheep, but the hair of certain species of other mammals, such as goats, alpacas, llamas, and rabbits, may also be called wool. This article deals explicitly with the wool produced from domestic sheep. The two qualities that distinguish wool are that it has scales that overlap like shingles on a roof and it is crimped (bends, curls, or folds); in some fleeces the wool fibers have more than 20 bends per inch. Human creativity and the special role of humans in nature have allowed the domestication of sheep for the production of wool and the development of technologies to process that wool for a variety of uses. Wool is used for clothing, carpeting, insulation, upholstery, and even to cover piano hammers, as part of a global industry with an estimated annual worldwide output of 5.5 billion pounds (Blanchfield 2002). Wool is a type of hair. Hair is a filamentous, often pigmented, outgrowth from the skin that is found only on mammals. The threadlike fibers, which protrude from the epidermis, the outer layer of skin, consist of nonliving cells whose primary component is keratin. Keratins are proteins, long chains (polymers) of amino acids. In non-human species, the body hair, when in sufficient amounts, is commonly referred to as fur, or as the pelage (like the term plumage in birds). In addition to sheep, various camels, goats, and rabbits produce hair that is also classified as wool (Blanchfield 2002). Scientifically, wool is a keratin protein, whose length usually ranges from 1.5 to 15 inches, and that is made up of three components: the cuticle, the cortex, and the medulla (Blanchfield 2002). The outer layer, the cuticle, is a protective layer of scales arranged like shingles or fish scales, which tend to cling and stick to each other when two fibers come into contact. The cortex is the inner structure of millions of cylindrical, cortical cells, which normally contain melanin, and whose arrangement tends to provide a natural crimp unique to wool. The medulla, often lacking in fine wools, are cells that provide air spaces, adding thermal insulation. Wool fiber is hydrophilic, having an affinity for water, and thus is easily dyed, and is also quite elastic, being able to be stretched 25 to 30 percent (Blanchfield 2002). Wool's scaling and crimp make it easier to spin and felt the fleece. They help the individual fibers attach to each other so that they stay together. Because of its nature, wool fabrics have a greater bulk than other textiles and retain air, which causes the product to retain heat. Insulation also works both ways; bedouins and tuaregs use wool clothes to keep the heat out. The amount of crimp corresponds to the thickness of the wool fibers. 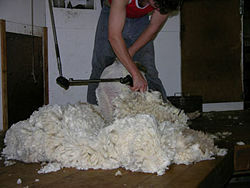 A fine wool like merino may have up to a hundred crimps per inch, while the coarser wools like karakul may have as few as one to two crimps per inch. What is typically called hair, by contrast, has little if any scale and no crimp and little ability to bind into yarn. On sheep, the hair part of the fleece is called kemp. The relative amounts of kemp to wool vary from breed to breed, and make some fleeces more desirable for spinning, felting or carding into batts for quilts or other insulating products. Wool is generally a creamy white color, although some breeds of sheep produce natural colors such as black, brown, and gray. As the raw material has been readily available since the widespread domestication of sheep—and of goats, another major provider of wool— the use of felted or woven wool for clothing and other fabrics characterizes some of the earliest civilizations. Prior to invention of shears, probably in the Iron Age, the wool was plucked out by hand or by bronze combs. The oldest European woolen textile, from about 1500 B.C.E., was preserved in a Danish bog. In Roman times, wool, linen, and leather clothed the European population: the cotton of India was a curiosity that only naturalists had heard of, and silk, imported along the Silk Road from China, was an extravagant luxury. Pliny's Natural History records a Roman reputation for producing the finest wool was enjoyed by Tarentum, where selective breeding had produced sheep with a superior fleece, but which required special care. 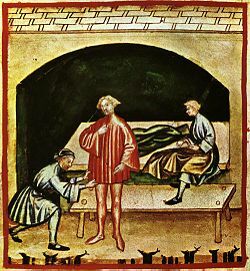 In medieval times, as trade connections expanded, the Champagne fairs revolved around the production of woolen cloth in small centers such as Provins. The network that the sequence of annual fairs developed meant that the woolens of Provins might find their way to Naples, Sicily, Cyprus, Majorca, Spain, and even Constantinople (Braudel 1982). The wool trade developed into serious business, the generator of capital. In the thirteenth century, the wool trade was the economic engine of the Low Countries and of Central Italy. By the end of the following century, Italy predominated, though in the sixteenth century Italian production turned to silk (Braudel 1982). Both pre-industries were based on English raw wool exports—rivaled only by the sheepwalks of Castile, developed from the fifteenth century—which were a significant source of income to the English crown, which from 1275 imposed an export tax on wool called the "Great Custom." Economies of scale were instituted in the Cistercian houses, which had accumulated great tracts of land during the twelfth and early thirteenth centuries, when land prices were low and labor still scarce. Raw wool was baled and shipped from North Sea ports to the textile cities of Flanders, notably Ypres and Ghent, where it was dyed and worked up as cloth. At the time of the Black Death, English textile industries accounted for about ten percent of English wool production (Cantor 2001). The English textile trade grew during the fifteenth century to the point where export of wool was discouraged. In earlier centuries, the English, who were proficient in raising sheep, would sell their wool to the Flemish, who had developed skills for processing (Blanchfield 2002). The Flemish then sold it back to the British. Over the centuries, the British recognized the value of both raising sheep and doing the processing, and enacted laws to help control the wool trade. Some laws required the use of native wool even in burials, and that judges, professors, and students wear robes of English wool (Blanchfield 2002). The smuggling of wool out of the country, known as owling, was at one time punishable by the cutting off of a hand. After the Restoration, fine English woolens began to compete with silks in the international market, partly aided by the Navigation Acts; in 1699 English crown forbade its American colonies to trade wool with anyone else but England itself. A great deal of the value of woolen textiles was in the dyeing and finishing of the woven product. In each of the centers of the textile trade, the manufacturing process came to be subdivided into a collection of trades, overseen by an entrepreneur in the system English call the "putting-out" system, or "cottage industry" and the Germans term Verlagssystem. In this system of producing woolen cloth, until recently perpetuated in the production of Harris tweeds, the entrepreneur provides the raw materials and an advance, the remainder being paid upon delivery of the product. Written contracts bound the artisans to specified terms. Fernand Braudel (1982) traces the appearance of the system in the thirteenth-century economic boom, quoting a document of 1275. The system effectively by-passed the guilds' restrictions. Before the flowering of the Renaissance, the Medici and other great banking houses of Florence had built their wealth and banking system on their textile industry based on wool, overseen by the Arte della Lana, the wool guild: wool textile interests guided Florentine policies. Francesco Datini, the "merchant of Prato," established in 1383 an Arte della Lana for that small Tuscan city. The sheepwalks of Castile shaped the landscape and the fortunes of the meseta that lies in the heart of the Iberian peninsula; in the sixteenth century, a unified Spain allowed export of Merino lambs only with royal permission. The German wool market—based on sheep of Spanish origin—did not overtake British wool until comparatively late. Australia's colonial economy was based on sheep raising and the Australian wool trade eventually overtook that of the Germans by 1845, furnishing wool for Bradford, which developed as the heart of industrialized woolens production. Due to decreasing demand with increased use of synthetic fibers, wool production is much less than it has been in the past. The collapse in the price of wool began in late 1966, showing a 40 percent decline in some quarters; with occasional interruptions, the price has tended down (Easton 2006). The result has been sharply reduced production and movement of resources into production of other commodities, in the case of sheep growers, to production of meat (Easton 2006; ABS 2000; USDA 1996). Wool straight off a sheep contains a high level of grease, which contains valuable lanolin, as well as dirt, dead skin, sweat residue, and vegetable matter. This state is known as "grease wool" or "wool in the grease." Before the wool can be used for commercial purposes it must be scoured, or cleaned. Scouring may be as simple as a bath in warm water, or a complicated industrial process using detergent and alkali (AATSE 2000). In commercial wool, vegetable matter is often removed by the chemical process of chemical carbonization. In less processed wools, vegetable matter may be removed by hand, and some of the lanolin left intact through use of gentler detergents. This semi-grease wool can be worked into yarn and knitted into particularly water-resistant mittens or sweaters, such as those of the Aran Island fishermen. Lanolin removed from wool is widely used in the cosmetics industry. After shearing of the sheep, the wool is separated into five main categories: fleece (which makes up the vast bulk), pieces, bellies, crutchings, and locks. The latter four are packaged and sold separately. 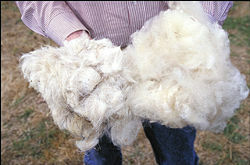 The quality of fleece is determined by a technique known as wool classing, whereby a qualified woolclasser tries to group wools of similar gradings together to maximize the return for the farmer or sheep owner. The quality of wool is determined by the following factors, fiber fineness, length, scale structure, color, cleanliness, and freedom from damage (Kadolph and Langford 2002). For example merino wool is typically three to five inches in length and is very fine (between 12-24 microns) (AASMB 2007). Wool taken from sheep produced for meat is typically more coarse, and has fibers are 1.5 to 6 inches in length. Damage or "breaks in the wool" can occur if the sheep is stressed while it is growing its fleece, resulting in a thin spot where the fleece is likely to break (Van Nostran 2006). In general, anything smaller than 25 microns can be used for garments, while coarser grades are used for outerwear or rugs. The finer the wool, the softer it will be, while coarser grades are more durable and less prone to pilling. Global wool production is approximately 1.3 million metric tons per year of which 60 percent goes into apparel. Australia, China, New Zealand, and Argentina are leading commercial producers of wool, with Australian wool accounting for about one-quarter of the world's production (Blanchfield 2002, AWI 2005). Most Australian wool comes from the merino breed. Breeds such as Lincoln and Romney produce coarser fibers and wool of these sheep is usually used for making carpets. China has the greatest number of sheep (AWI 2005). The United States is the largest consumer overall. Blanchfield (2002) lists the United States as one of the four top suppliers of raw wool. In the United States, Texas, New Mexico and Colorado have large commercial sheep flocks and their mainstay is the Rambouillet (or French Merino). There is also a thriving "home flock" contingent of small scale farmers who raise small hobby flocks of specialty sheep for the handspinning market. These small scale farmers may raise any type of sheep they wish, so the selection of fleeces is quite wide. Global wool clip 2004/2005 (AWI 2005). Keeping with the times, organic wool is becoming more and more popular. This blend of wool is very limited in supply and much of it comes from New Zealand and Australia (Speer 2006). In addition to clothing, wool has been used for carpeting, felt, wool insulation, and upholstery. Wool felt covers piano hammers and it is used to absorb odors and noise in heavy machinery and stereo speakers. Ancient Greeks lined their helmets with felt and Roman legionnaires used breastplates made of wool felt. Wool has also been traditionally used to cover cloth diapers. Wool felted and treated with lanolin is water resistant, air permeable, and slightly antibacterial, so it resists the buildup of odor. Some modern cloth diapers are using felted wool fabric for covers, and there are several modern commercial knitting patterns for wool diaper covers. 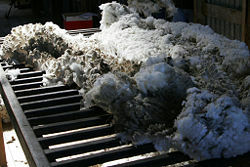 Shoddy is recycled or re-manufactured wool. To make shoddy, existing wool fabric is cut or torn apart and respun. As this process makes the wool fibers shorter, the re-manufactured fabric is inferior to the original. The recycled wool may be mixed with raw wool, wool noil, or another fiber such as cotton to increase the average fiber length. Such yarns are typically used as weft yarns with a cotton warp. The term virgin wool distinguishes wool that will be spun for the first time rather than the fiber from shoddy. Ragg is a sturdy wool fiber made into yarn and used in many rugged applications like gloves. Australian Academy of Technological Sciences and Engineering (AATSE). 2000. Technology in Australia 1788-1988 Australian Science and Technology Heritage Centre. Retrieved March 13, 2008. Austalian Bureau of Statistics (ABS). 2000. 1301.0 - Year Book Australia, 2000 Australian Bureau of Statistics. Retrieved March 13, 2008. Australian Wool Innovation. 2005. Australia's wool industry WoolFacts. Retrieved March 13, 2008. Blanchfield, D. S. 2002. How Products are Made: An Illustrated Guide to Product Manufacturing. Detroit: Gale Group. ISBN 0787636436. Braudel, F. 1982. The Wheels of Commerce. Volume 2 of Civilization and Capitalism. New York: Harper & Row. ISBN 0060150912. Easton, B. 2006. The European economy: A history Te Ara - the Encyclopedia of New Zealand. Retrieved March 13, 2008. Kadolph, S. J., and A. L. Langford. 2002. Textiles. Upper Saddle River, NJ: Prentice Hall. ISBN 0130254436. New Zealand Trade and Enterprise (NZTE). 2007. Wool and fiber industry profile MarketNewZealand.com. Retrieved March 13, 2008. Speer, J. K. 2006. Shearing the edge of innovation. Apparel Magazine, May 1, 2006. USDA. Foreign Agricultural Service. 1996. Sheep, lamb, mutton, and goat meat Foreign Agricultural Service. Retrieved March 13, 2008. Van Nostran, D. 2006. Wool management: Maximizing wool returns Mid-States Woolgrowers Cooperative Association. Retrieved March 13, 2008. This page was last modified on 14 April 2011, at 18:48.